EAST RUTHERFORD, N.J. — Anthony Dable’s path to the Giants’ training facility is so improbable, so ridiculous that it is hard to believe it wasn’t made up by a bunch of Hollywood scriptwriters. Let’s take a postal worker from Grenoble, France, who never played a down of college football and plunk him down in a huddle with Victor Cruz and Eli Manning. Even better yet, let’s say he learned English from watching videos on NFL.com and caught the attention of the Giants after posting a video of himself on YouTube. Finally, let’s make him a 27-year-old rookie, who knows this is his one shot of making his dream come true. 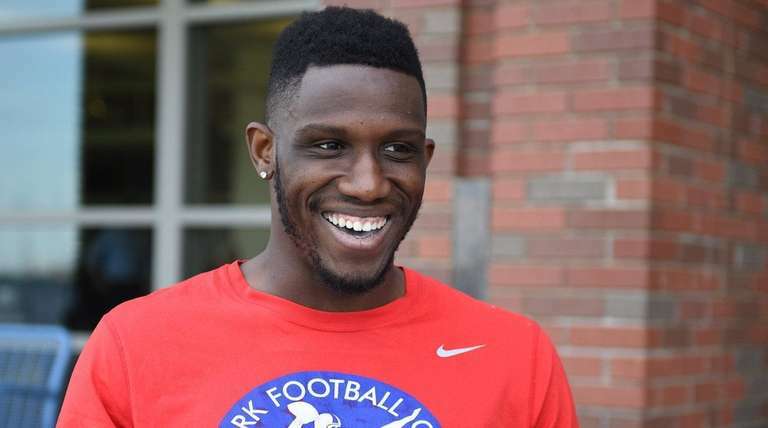 Dable, a 6-5, 215-pound wide receiver, is hoping to become one of a handful of European players without college experience to make an NFL roster. And at least one well-known former Giant believes he has a very good chance of doing so. Osi Umenyiora, who now works for the league in London as an NFL ambassador and TV broadcaster, helped connect Dable with the Giants and the XPE Sports Academy in Boca Raton, Florida, after watching a video of him playing American football for the New Yorker Lions of the German Football League. “I was shown a video and I was like wow,” Umenyiora said in a phone interview last week. “The things he was doing on the football field, you could tell they would translate. He’s a tremendous athlete and once I saw his size, I thought he had a good chance. That’s pretty amazing considering Dable never played a down of American football before he was 19. Dable learned about the NFL by playing a Nintendo 64 video game — NFL Quarterback Club 98 — when he was 17 years old. He became hooked after staying up all night to watch the Steelers beat the Seahawks in Super Bowl XL. A soccer and handball player, Dable said something about American football instantly appealed to him. When he was 19, a friend of his told him about a club team in town. He showed up at practice and declared he wanted to be a running back. The coach of the Grenoble Centaurs took one look at his height and decided that wide receiver made better sense. Dable played six years with the Centaurs, went to Canada briefly but got sent home because of a paperwork problem and then ended up in Germany, where he won two national championships and a European championship. Though the NFL is his dream, at age 27 he was starting to feel that it might never happen. He was ready to enroll in business school and begin coaching a kids’ team in Grenoble when he received the call from Umenyiora. Two weeks later he was on a plane to Florida in February to work out at XPE, where veterans keep in shape in the offseason and prospects train to get ready for the NFL Combine. It was there that he met his agent, Kyle Strogin, who lined up interviews with the Giants, Seahawks, Chiefs, Jaguars, Cowboys, 49ers and Cardinals. Umenyiora made sure the Giants got the first crack at him. They liked what they saw and so did Dable, so he canceled the rest of his interviews and signed as a free agent. “”He’s a big, good-looking player who took direction well,” Giants coach Ben McAdoo said. Last week’s OTAs at times seemed almost surreal for Dable as he tried to get used to lining up next to players he used to spend hours studying tapes of on YouTube.